← This heart -breaking world journey. Note- This was a post from October 22. It appeared on one blog and not the other (a few of them). I am catching up the missing posts here, so sorry if you get hit with several posts at once! Yesterday, I returned to Sonoma for the first time since the wild fires. My fear of facing the changes the wrought by the fires kept me from pressing too hard on the gas. Not long after I passed the Sonoma line, my heart clenched as I passed acres of blackened hills. Cows grazed on the infrequent patches of grass between the ashes. 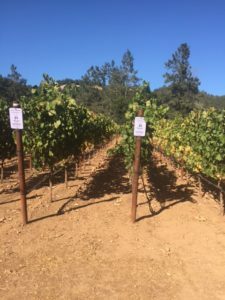 Further on, the topography shifted and there was the Sonoma I love – lush vineyards and manicured winery estates. The weather was perfect, warm but with a welcome dampness in the air after a night’s rain. But my heart was full, tears threatening to erupt at the strange contrast of beauty on one side of the hill and bleak charred blackness on the other. Ironically. I blogged a month ago about a small fire we had on our property, and my feeling of helplessness in the face of life’s chaos. I could never have imagined when I wrote that piece the true chaos that was about to erupt in our bucolic world – the intense destruction, the many deaths and enormous devastation. The fires, the deadliest in California history, blew up two Sundays ago, and then continued to burn for over a week. The fire that threatened our home most directly, the Nunn’s fire, was actually three fires that merged together over the week. Like Chimera, it was a three-headed monster that burned mercilessly. The nearby Tubbs and Atlas fires destroyed large swaths of Santa Rosa and Napa. Thousands of homes burned, over forty died, and many other were seriously hurt. The winds were so strong, and the land was so dry. Those two factors left us completely vulnerable. An army of fire-fighters and first responders from many states and even other countries fought with amazing heroism. But so much was lost. I am one of the lucky ones. I was safe in another county through-out, glued to my phone and the TV, crying as the news got worse and worse, more friends evacuated, more homes lost. One night, the fire a safe distance, my husband and I came to our home and hurried through it, grabbing what we could take quickly– the photo albums, year books, a few mementos. How do you decide, as you stand in the family room, what is most important to you? To your children? I glanced at the art on the walls, made by friends, to large to take with us, at the pillows I picked with my daughter, the tea pot from my best friend…and realized the enormity of the loss so many were facing. I said goodbye to the house in my mind and we drove down the hill. The ridges on both sides of the valley glowed a deep red in the distance- one in Kenwood, one in Napa -and the world was eerily silent. The stories are emerging from these hellish past two weeks. Couples who pulled one another from the wreckage, neighbors carrying seniors to help, pets and owners reunited. In the midst of the raging flames many bonds were forged, heroes were born, and the community came through for one another. Sonoma shone with a spirit of resolve and deep caring. It will be years for many families to recover, to find a new place to call home, to recover the financial losses, and find a new normal. But the valley will come back – they are “Sonoma strong”. I have not yet gone to see some of the places I love most – places that are described in The Vines They Planted. I know that some of these places fared well – the square, the Mission, and a few favorite wineries. Others are gone, and I can’t quite imagine the gray ash at my feet where I am used to walking on winding trails through shady woods. I feel a strange art/life collision, as one of the characters in my novel actually faces the burning of a home, and rising from the ashes. Every-one in the novel has lost something, and is pushed to find their resilience, and in that way the novel again reflects the realities of life. My characters reflect the “real” people I know here. They are passionate, embracing, quick to share a glass of wine and a conversation, and willing to work hard to create something beautiful or delicious. They love the land, and are aware of the gifts bestowed on them simply by living here. They are unusually resilient, committed to one another, and grounded in the land. They are a complex mixture of multi-generational winemakers, tourists who fell in love and could not leave, immigrants motivated to create a better life, and families. These folks will not give up. This is their home. Many vines are still standing, many barrels were untouched. The community will gather again soon, and raise a glass to the valley where love and wine flow, and hope continues to reside.